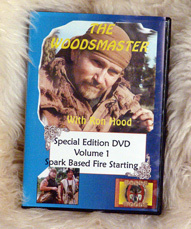 In the first volume of the Woodsmaster© Video Series, you will discover the secrets of Spark Based Firemaking! You will learn how to create that first spark using tools like the Firebow, Flint and Steel, the Metal Match, and even a flashlight! The firebow section alone includes over 30 minutes of detail covering the collection of materials, preparation, construction and use of the firebow! You will learn carving secrets, tool selection, basic cordage theory and safety. And tucked away here and there are some of the special Woodsmaster wilderness tricks that really pay off. There has never been a clearer, more effective, instruction on the use of the firebow. If you ever wanted to learn fire by friction, this is the video you need! All together, there's 1 hour and ten minutes of blaze-making instruction!